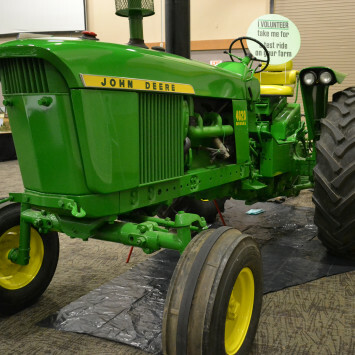 Loyalty of John Deere enthusiasts and collectors highlighted during keynote presentation at Gathering of the Green. 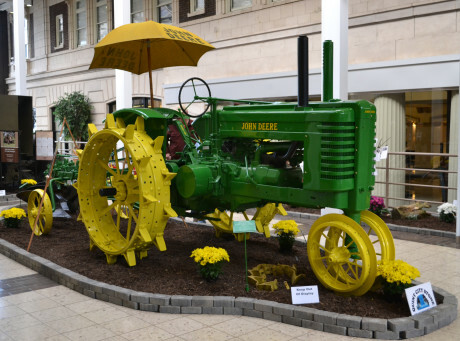 Gathering of the Green, a semi-annual conference for John Deere enthusiasts took place in Davenport, Iowa in March. Mike Mack, group president, Financial Services, Global Human Resources and Public Affairs, spoke at the opening night reception of more than 600 people about the exceptional loyalty shown by John Deere customers and collectors. His speech in its entirety is below, along with a gallery of images from this year’s event and details about the gathering from its organizer. 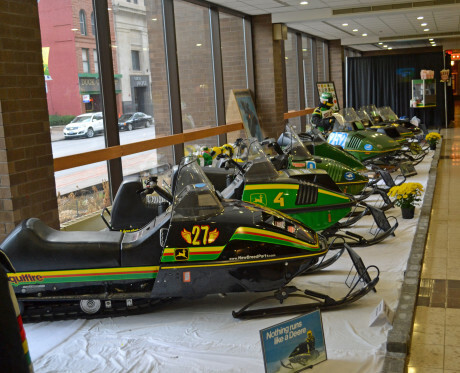 Images from this year's event in Davenport, Iowa. 1965 John Deere 4020 Diesel Tractor owned by Mark. M.
John Deere Raker Bar Cylinder Late Hay Loader. Owned by Richard B. 1941 John Deere Model "B" #107879 owned by Mark and Dion O. 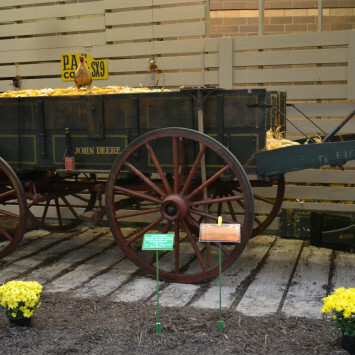 1934 John Deere 36" High Wheel Wagon with Scoop Board. Owned by Wes & Lois T.
1959 John Deere 730 Diesel Standard. Owned by Richard B.
John Deere No. 55A 3 Bottom Tractor Plow. Owned by Al M. Family. 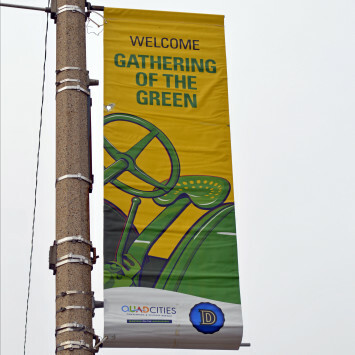 The 2016 Gathering of the Green took place in Davenport, Iowa. 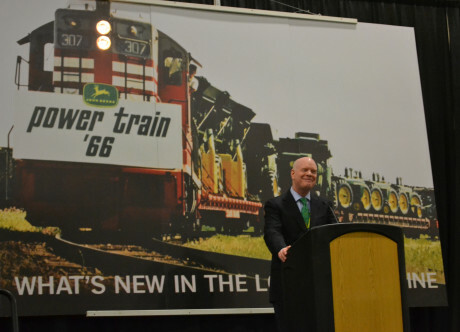 Mike Mack, John Deere group president, Financial Services, Global Human Resources and Public Affairs, spoke at the opening night reception of more than 600 people about the exceptional loyalty shown by John Deere customers and collectors. Good evening, everyone. It’s a privilege to be here in a sea of green and yellow to be a part of what can only be called a celebration of Irrational Loyalty. Your commitment and passion define what Irrational Loyalty means, and I’m learning more about it every day. A couple of years ago, I was given management responsibility for the John Deere brand. I have to admit, it’s the kind of work I really enjoy. 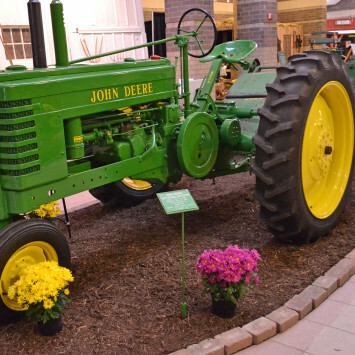 Our brand group includes the John Deere Pavilion, the Tractor & Engine Museum in Waterloo, John Deere Historic Site, and John Deere Archives. All are places I hope you are familiar with — and some of which I know you are visiting this week. These are places where we tell the Deere story, our past, present and future. Which, when you think about it, is what events like this are all about. 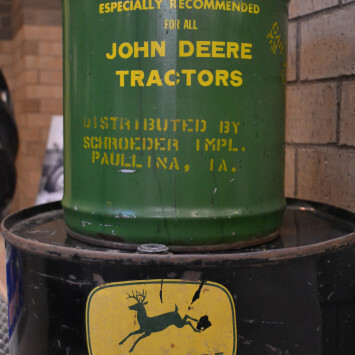 A while back, a few of us got into a conversation regarding the “Two-Cylinder Club” — another group passionately committed to the preservation of John Deere tractors. At one point, I spoke up, “Sure, they’re nuts! But, they are our nuts, and we need to support them.” I know that because it takes one to know one. Many of us who have been a part of Deere for a long time, myself included, proudly call ourselves nuts. And we consider it a compliment! In fact, we would be offended if we weren’t called nuts. “Nuts” in this case refers to a degree of loyalty to John Deere and our brand that is so strong it borders on the irrational. John Deere enjoys a sense of affinity and loyalty from its various constituents that may be unparalleled compared with other companies. No doubt, I am now speaking to a group of people who define the profile perfectly. Some of you have traveled cross country, or may have come from far parts of the world, to attend this event. You do so because you want to and because it’s something you feel committed to. That just does not happen at many other companies. John Deere is all about long-term relationships — not only with employees but also with customers, dealers and of course, collectors. These relationships span years, even decades, and sometimes generations. 74% said they were second- or third-generation customers. And — it gets better — 5% said they were fifth-generation customers! How many companies can say that? How many other companies have been around long enough to even have multi-generational customers? I know something about this from personal experience. This John Deere No. 55A 3 Bottom Tractor Plow is owned by the Al M. Family and was on display at this year's Gathering. A few years back, at a dinner with former Deere CEO Bob Lane, he asked each of us around the table where we would be without John Deere. When it came to my turn, I responded that I would be nowhere without John Deere. Literally. You see, my parents first met at the John Deere Dubuque Works in 1947 and were two of the plant’s earliest employees. The story goes that one day a young woman handing out payroll checks caught my dad’s eye. For good measure, she had just been named “Miss John Deere Dubuque Works.” I realize that might not seem politically-correct today, but it does help explain his interest. At any rate, if not for John Deere, they would not have married and raised a family of eight children, including me. To take it a step further, they even arranged for my twin sister and me to have our birthdays on the first day of the Deere fiscal year, November 1. Now that takes planning. And I guess it makes me a company man from day one, literally. My father, brother, uncle, and cousin worked for John Deere for over 40 years. My college roommate has been an engineer at John Deere Ottumwa Works for 39 years. I’m the underachiever of the family, having been here just 30 years. My father was the Director of the Product Engineering Center in Waterloo, from 1971-1987. He had design responsibility for worldwide agricultural tractors and diesel engines. At the family dinner table, it was normal for us to talk about tractor drawbar power, final drive pinion design, and engine torque rise. That’s another reason I jumped at the chance to be here tonight. If you think about it, a vintage tractor show is something like a new-product show. The only real difference is the age of the product. I’ve had the good fortune to be involved in many product intros during my career. Now, I personally can’t provide insights into Power Train ’66, which was a bit before my time. But, I suspect that my Dad did work on it as he was involved in John Deere tractor drive train design back in those days. However, the 1972 product show was a memorable one for me. 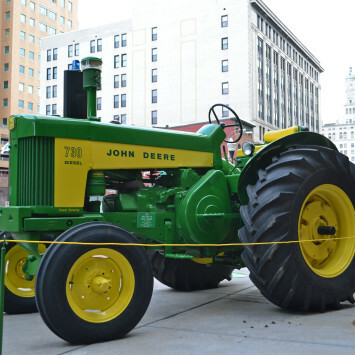 Amid much fanfare, in 1972 John Deere introduced the Generation II tractors in Waterloo, Iowa. Generation II was characterized by the Sound GuardTM body, the first truly successful integrated tractor cab. The Generation II tractors offered other innovative features such as a Quad RangeTM transmission and Deere’s new Perma-ClutchTM, a wet clutch that would last virtually the life of the tractor. Some of you may recall John Deere dealers attending the product introduction and receiving “Way Out in Front” caps. They had ridiculously long front bills to symbolize our leadership over competition. Tractors were not the only machines to see at the Gathering of the Green. 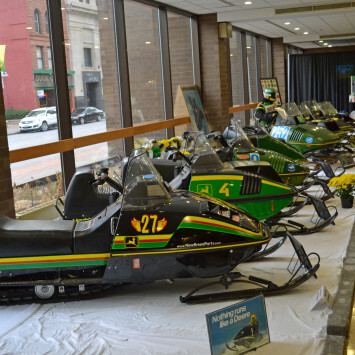 A large contingent of John Deere snowmobiles were also displayed. At the 1972 introduction, another family connection developed, with the brief appearance of one of my sisters on behalf of the company. At the same event, she introduced the John Deere bicycle to dealers, while riding it around the tent when she was 11 years old. She recently told me the “rest of the story” related to this event. About a half hour before the big event, all of the shiny new John Deere bicycles were lined up ready to go in perfect order, as you might imagine. Someone asked her to take the golf cart and run an errand for them. When she came back, she braked too late and bumped into the first bike, and the bikes went down like a bunch of dominoes. You should have seen people scrambling. Like you, I could go on and on about my connection with John Deere and what it means to my family. But, what about the brand itself? What is it about John Deere and its brand that inspires such affinity and loyalty — rational or otherwise? 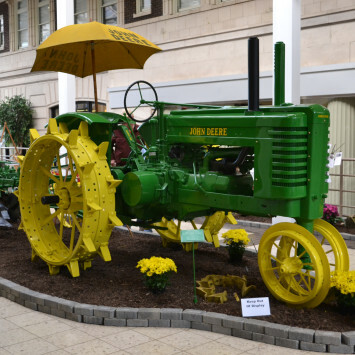 “The Gathering,” as attendees like to call it, started in 2000 after members of four John Deere collector clubs decided to organize a convention for John Deere aficionados. 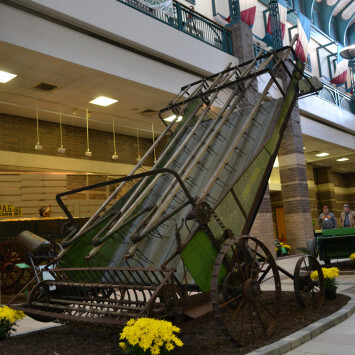 Gathering of the Green Chairman Tony Knobbe called the event a “Deere family reunion.” It brings John Deere equipment fans together to meet each other, learn about equipment and restoration, and celebrate their love of all things John Deere, he said. In the lingo of brand management, we say our brand is fairly narrow — so it does not become diluted — and also exceptionally deep. It stands for something. I believe the strength of the company, its identity, and its brand, begin with our purpose. Technically, Deere’s higher purpose–which you see spelled out from time to time, is — committed to those linked the land. But I submit that’s only part of the story, a means to an end. Our real purpose is what that commitment leads to. What it leads to — helping feed a hungry world and provide shelter for its inhabitants — is a goal that stirs the soul. In my view, we should never take that higher purpose for granted or for a moment believe that it doesn’t have great emotional effect on people. Many groups—employees, customers and enthusiasts — associate with John Deere because they relate to this noble purpose. And I strongly suspect that includes many of you here tonight. Together, we have an important responsibility — celebrating the past while continuing to evolve for the future. And let’s be realistic — if a company doesn’t grow and prosper, doesn’t evolve in other words, neither does its history. Paradoxically, a company’s ability to survive and thrive for such a long time — similar to a living organism — reflects its ability to keep some things unchanged — such as values, in Deere’s case our North Star — and yet also be able to adapt to changing business environments, technology, threats and opportunities. 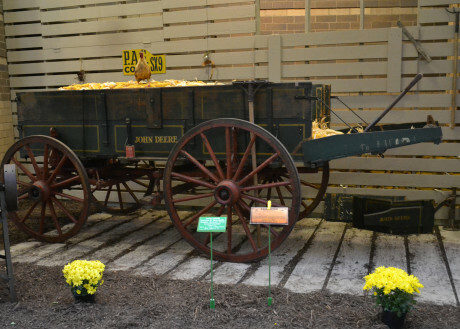 This year's Gathering included a 1934 John Deere 36" High Wheel Wagon with Scoop Board, owned by Wes & Lois T.
Each generation evolves. It’s why some collect Two Cylinder tractors, and others prefer the New Generation. Others love construction equipment, or snowmobiles, or lawn tractors. It’s the same spirit that John Deere moves forward with today. Exactly how, when or where this will happen we can only guess. But we can safely bet that it will! So, you see, our past and our future come from the same place. From people like you, and like me, who evince such a passionate degree of loyalty for our company. It’s because of your rabid devotion to Deere … scouring fence lines, swamps, and abandoned buildings to find that rare John Deere tractor. Or, tracking down your father’s or grandfather’s tractor that was sold 40 years ago. Or any of those types of pursuits that defy what most people would consider rational behavior. It’s because of all these things that John Deere thrives today, eight generations after its founding. And it’s why I see no reason we won’t continue to thrive for many generations to come. Thank you again for being associated with this amazing event, and for coming to the Quad Cities to celebrate all things John Deere. Thank you. If you enjoy learning more about vintage farm equipment then be sure to check out these related stories.